Join other individuals and families for a fun 5 days and 4 nights of exciting time escorted personally by Mike and Debra Kuchera. Leave the details and the driving up to us! Your, your family or friends - come to relax and enjoy!! Accepting reservations for each expedition date - please contact us for pricing information. DAY ONE: Welcome to the Black Hills of South Dakota! Afternoon arrival at the Rapid City Regional Airport and checking in at the historic Hotel Alex Johnson downtown Rapid. If time permits for those who arrive early, we will visit The Journey Museum. The Journey Museum takes you on an incredible trek through time, from the formation of the mystical Black Hills over 2.5 billion years ago to the continuing saga of the western frontier. Four unique prehistoric and historic collections allow you to actually see, hear and touch history. After everyone has arrived, we will have a welcome and get together at the Fire House Brewery, where we can also have our evening meal. An Option – if everyone gets in on time – old fashioned country hoe down at a Chuckwagon Dinner and Country Music Show (kind of corny, but you would get a kick out of it). Also for those arriving earlier in the day – we can arrange sightseeing in Rapid City. On to Custer State Park - 73,000 picturesque acres of the Southern Black Hills, one of the largest State parks in the nation. Thrill to a Buffalo Jeep Camera Safari. You are likely to see one of the largest publicly owned buffalo herds in the country. Participants will ride in jeeps especially made for off-road tours through back country not accessible to the general public. It is a wonderful opportunity to get up close to wildlife and nature and take wildlife photography. We will enjoy a delicious bbq lunch before venturing along for the rest of the day on the beautiful lawn of the State Game Lodge, President Coolidge’s summer time retreat . After lunch, we will depart for Wall Drug Store in Wall. The Wall Drug Store got its start during the Depression years by offering Free Ice Water to thirsty travelers and by building its reputation on friendly service. Self-guided tour, shopping, fun and entertainment. Completely unique. And don’t forget to use the restrooms! See the T Rex in the Backyard. At this time our tour departs north of Wall, to a working ranch. You will enjoy a beautiful ride along the white banks of the Cheyenne River. A special treat is awaiting you this evening. We will play “City Slickers” when we mosey out on the trail to a real working ranch. You will take a step back in history to the pioneer days when we board the wagons and go on a wagon ride along the Cheyenne River. We will sit around a campfire and eat a real cowboy supper and be entertained by authentic western characters. We are honored to have a personal friend from the Rosebud Sioux Tribe – performing “Nurturing the Tree/Hoop” dance with 26 hoops. He is also a champion storyteller, and touring artist. Following this program, we will depart and overnight in Wall, South Dakota, at a comfortable motel. 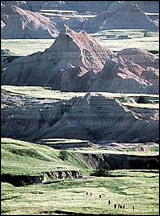 We will get up close and personal with a guided morning walk into the Badlands National Park. It is famous for its fantastically eroded landscapes. Fossils 37 to 23 million years old appear from eroding buttes and gullies. Buffalo, Pronghorn Antelope, Big Horn Sheep, Mule Deer and other small prairie animals may be seen throughout the Badlands. Following this, we will visit the Ben Reifel Visitor Center which features a new exhibit gallery, an enlarged bookstore, a new information desk and 100-seat theatre with surround sound. The rest of the day you will experience the Lakota culture, history, land and wildlife of the Pine Ridge Indian Reservation. You will be escorted through the vast Pine Ridge Reservation highlighting the main attractions, one of which is Wounded Knee. You will be taken to places that are “off the beaten path”. 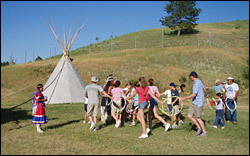 Lakota guides will be along to give you facts and history about their people, culture and places. We will be eating lunch at a cafe in the middle of the Pine Ridge. Opportunities will be available for the children to participate in beadwork or making medicine wheels from porcupine quills. The children may have the chance of having their hair braided and getting painted up like warriors. We will visit a famous school founded by Chief Red Cloud and the Jesuits near Pine Ridge. A world-famous annual art exhibition is being held at the Red Cloud Heritage Center where members of your group will have an opportunity to view and purchase Native American art from all across the continent. 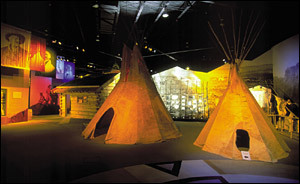 It will also provide an educational opportunity for you about the Lakota past and present way of life. We will be stopping at a casino located on the Pine Ridge for our evening meal and a little gambling before heading back to the Black Hills where we will overnight at a comfortable hotel in Keystone, South Dakota. Keystone is located just south of Rapid City, at the base of Mount Rushmore. It is originally a mining town now turned into a lively resort town. It is a fun village to visit with lots of shopping for gifts and souvenirs and Black Hills Gold jewelry. DAY FOUR: Gold in them their hills! Following breakfast at the hotel you will be able to experience Old Keystone by visiting an authentic gold mine. Big Thunder Gold Mine has recaptured the excitement and romance of this bygone era. Find yourself traveling back in time as you tour the authentic 1890's gold mine and learn about the mining experience from knowledgeable guides. They feature a video on mining history and you can also learn how to pan for gold where you're guaranteed to find a sample of 24K genuine placer gold! Discover the artist and the man, Gutzon Borglum! We will visit the Borglum Historical Center in Keystone. An exciting tour for the whole family! Venture into the world of Gutzon Borglum, the sculptor of Mount Rushmore, from the blasting of the stone to the grandeur of the "Seated Lincoln." The Borglum Story will enable children and adults to step back and become part of the carving years. The highlight of your Black Hills vacation will be visiting our National Shrine to Democracy – Mount Rushmore and the Visitors Center. The faces are 60 foot granite of four US Presidents carved by Sculptor Gutzon Borglum which tells the story of America’s first 150 years. We will feed our faces while viewing the Famous Faces!! Experience the Wild West Town of Deadwood, South Dakota on the final night of the tour. From Mount Rushmore we will mosey down the line to the truly wild west town of Deadwood, South Dakota. To get you familiar with the bygone era of the Wild West, we will hop on the Original Deadwood Tour bus, Deadwood’s “Ambassador to a fun ride through the history of the Old West”. You will be entertained and educated at the same time. You will be ready to experience Deadwood on your own following a delicious evening meal at one of Deadwood’s famous casinos. Option: The third tour date has an option to experience the Wild Bill Days Rodeo as an option to their trip to Deadwood. For those who like rodeos or haven’t experienced one before, this is the cream of the crop!! You will check in at an exciting hotel complex in Deadwood where you can have a free evening to experience the Deadwood night life or families can just stay back at the property and enjoy the different activities available. Today we will bid everyone farewell. After a leisurely breakfast, our guests will be taken to the Rapid City Regional Airport. For those who do not depart until later, we can make arrangements to visit one of South Dakota’s finest Native American gift shops in downtown Rapid City. Accommodations (4 nights), airport transfers, transportation while on the tour, activities on itinerary, meals, all lunches and suppers and some breakfasts (where property does not have continental breakfasts); national park and site fees, professional guides. Wild West Expeditions reserves the right to make changes in the published itinerary as deemed necessary for the comfort, convenience, or safety of the tour. Rates do not include airfare, alcoholic beverages and gratuities to escorts. To make a reservation, contact us with your choice of dates. If date of departure is less than 60 days, 100% of trip price paid now to book. If more than 60 days out, 50% deposit required with balance due 31 days before scheduled tours. Cancellation 91 days or more before trip departure – Full trip payment less a $200 cancellation/administration fee is refunded. Cancellation 61 to 90 days or more before trip departure – Full trip payment less $300 deposit is refunded.